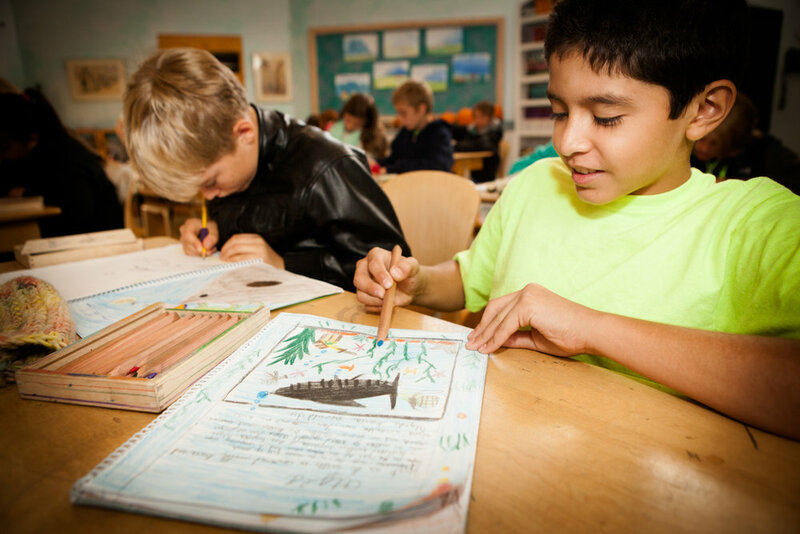 An emphasis on art distinguishes a Waldorf education. A fundamental human endeavor supporting fine motor skill development, cognitive function, emotional wholeness and creative innovation, drawing – incorporating form, line, space, and scale – is woven into the fabric of a wide variety of lessons. From color awareness to the history of artistic expression, pupils develop observational skills along with manual brush skills. Every year, each student produces an individual portfolio of paintings inspired by that year’s given themes. Early sculpture lessons, the first foray into three dimensional expression, begin with malleable materials like beeswax or clay before advancing to papier maché and wood. A favorite challenge in middle school is the construction of a fully articulated wooden marionette. Apart from supporting cognitive development, numeracy, and pattern recognition, proficiency in fiber arts – knitting, crocheting, sewing (by hand and by machine), dyeing and weaving – establishes a deep understanding of the materials, clothing, and coverings we live in and on every day. Beginning with the basics of safe and effective tool use students cut, carve, sand through projects both aesthetic and functional from whittling to furniture. Students build their patience while learning how the objects in their lives are constructed. With years of crafting and handwork training behind them, older students take on blacksmithing, casting, small engine repair, basic building construction, and bookbinding. For many, these are skills they will treasure forever. A unique offering to Waldorf schools, Eurythmy is a new art form developed by Rudolf Steiner that integrates music, speech, and dance. A custom built dance studio provides the ideal stage for this beautiful and interweaving of sound and form. Beginning in first grade students stage a dramatic production reflective of each years major themes, from fables to the Bard, students learn to love theatre through direct engagement with both acting and production. Underlying all lessons is a profound nurturing of appreciation for beauty, harmony, and order. From the crafting of personal “textbooks” in every lesson to the explorations of the development of human consciousness via the arts, students hone a aesthetic acumen. 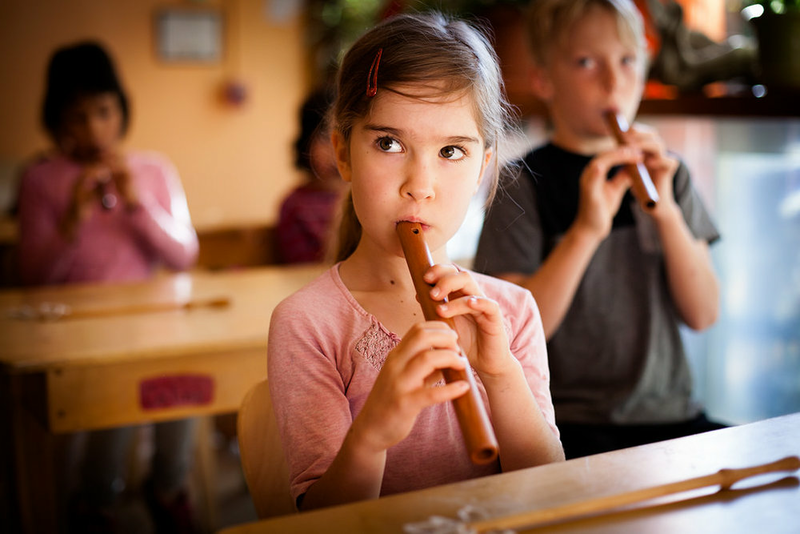 Children learn to play their flutes by ear, carefully listening and watching their teachers while growing accustomed to the sound of music, which supports their capacity of concentration. In Grade 4, they take up stringed instruments. Familiarity with musical notation, choral music, and recorder skills open the door for performance. For those new to the school we offer instruction in brass or woodwinds which can lead to experiences with jazz in high school. Musical performance, collaboration, and composition come to the fore. The jazz ensemble and the guitar ensemble take on classic and contemporary works. The soprano-tenor-alto-bass Lux Aeterna choir performs pieces from a range of historical periods, styles, and cultures.